It sometimes takes a local to notice the patterns and connections of their patch, which is exactly what David McVey does in his trio of personal observations about the changing nature of his neighbourhood, Leith. It’s easy to focus on the demises of community, but here he sees how forbidden spaces to him as a child, represented by the NO BALL GAMES sign, have been put to better use by the community. When I was a kid we didn’t have much of a garden, not a usable one anyway. We played around the community wherever we could. There was no real shortage of areas. Often varying sizes of grassy areas on the corners of the council flats would suit our need to kick a ball around and climb some walls. A lot of the council housing built after the war had generous size gardens along with a lot of empty space on corners between flats and interlinking streets that seemed to belong to, well nobody. These spaces are numerous in many of the communities around Edinburgh. I’ve only recently noticed how many there are. Repeating over and over again, NO BALL GAMES, NO BALL GAMES. In Leith some of these NO BALL GAME corners and waste or neglected pieces of land are being put to good use. Community gardens and orchards are being set up by people of the community in order to take back these obvious but at the same time almost invisible pieces of beneficial land and use them for a purpose determined by the community for the community. People are working to create new and ethically significant food relationships and practises which they see as helping to assist a multitude of concerns. In this sense, food production is used as a tool for addressing health, social and cultural issues in the community. Within this framework of community development, community gardens have become more widespread in Edinburgh with a drive towards community action and local food growing practices. Leith is no exception. The Leith Croft down at the links is a growing community garden project run and managed by Leith Community Crops in Pots. Over the past year this once neglected gravel tennis court has been transformed by members of the community into a productive paradise. A place that grows food as well as community. During the first growing season you could see beans and sunflowers standing tall amongst the squash and courgettes if you were just walking by. Everything grown there attracts more diversity, from bees to people. It’s a family friendly environment where all ages are encouraged to make Leith a ‘happy, healthy, leafy Leith’. Similarly The Lochend Community Growing project and orchard off Lochend road has been a community garden since 2011 and as well as using the garden to produce food they also engage with the community through events, talks and workshops. The productive nature of the community garden is rereinforced by its educational capacity. Skills are exchanged and traditional knowledge is passed on through practises that are being lost in the urban environment, from beekeeping to ecological stewardship, from preserve making to foraging. These NO BALL GAME areas have enormous potential for community food growing, relieving some of the pressures many people face, not just in Leith but all over Scotland, to supply themselves with food, never mind healthy food. They could be used to teach people about the environment, what it provides for us, and how vital our connection to it is, engaging adults and most importantly children, so that forms of traditional knowledge are carried on and cared about. This can also help to create jobs and opportunities for people that want to support the community and care about its development. And almost as important to all of that, they can become places where people of all ages and ethnicities in the community come together, engage with each other, share and learn, promoting a diversity that reinforces resilience both culturally and biologically in these often socially and environmentally unpredictable times. Community gardens like the Leith Croft and the Lochend garden, and all the other community gardens all across Edinburgh, show the potential these green spaces have to offer if communities took control of them and chose to use them. 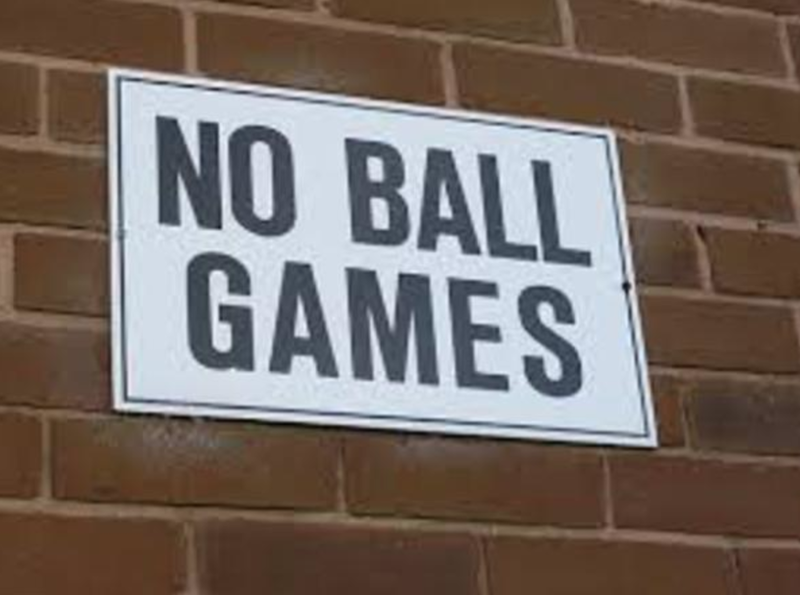 Next time you pass an area with a NO BALL GAMES sign, imagine the potential. DAVID MCVEY - David is a good friend of ours and runs Ostara, a 'cafe' on the Water of Leith and our go-to for Sunday lunch. His writing, like his food, is well observed, thoughtful, and a pleasure to consume.